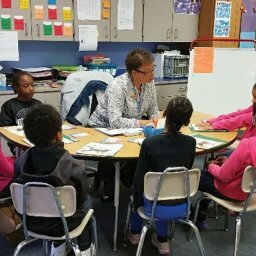 In high-performing urban schools, teachers check for understanding because they want to know how each student is proceeding toward mastery of the lesson’s specific objective. They ask questions to determine which concepts are understood by which students and which concepts have yet to be understood. Therefore, when teachers ask questions, they listen attentively. Similarly, when they ask students to write or demonstrate their understanding, teachers watch closely and notice what students write and do. They want to see students work so they can better understand students’ thought processes. Teachers in high-performing urban schools are eager to learn what students understand and what they may not yet understand. Teachers often probe to validate their assumptions about what students know and do not know. Importantly, teachers keep their specific objective in mind because they want to know how the student is progressing toward mastering the specific concept or skill. For example, if the objective requires students to analyze the findings from an experiment, the teacher may ultimately ask questions that demand analysis of complex information; however, en route to such an objective, the teacher may seek to ensure that students are mastering the details and concepts they will need to perform complex analyses later. As teachers listen and watch, they respond to students in ways that help students move closer to mastery of the objective. In particular, teachers provide feedback in ways that quickly correct misconceptions and affirm accurate responses. Rather than avoiding public acknowledgment that a given answer is indeed wrong and spending time attempting to elicit a correct response, a teacher might respond, “No, that is incorrect,” and then offer the correct answer. The teacher might challenge students to explain why the initial answer was incorrect or why the correct answer makes sense, but the teacher does not leave students guessing about accurate or inaccurate information. Teacher feedback is prompt, clear, and respectful. Throughout the lesson, teachers continually make decisions about instruction based upon their perceptions of levels of student understanding. In other words, the lesson activities are influenced by feedback received from students. 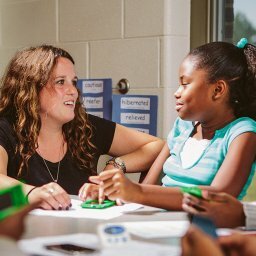 Teachers decide what students might need to understand, see, hear, touch, or experience to advance closer to mastering the lesson objective. 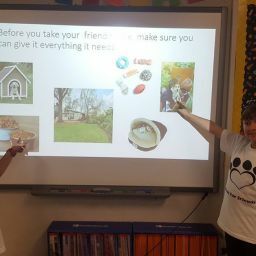 Often, teachers might try to adapt their presentation of a concept in a manner that better connects to the interests, backgrounds, learning styles, prior experiences, or culture of the students they serve. In addition to adapting lesson content, teachers might alter the pace of instruction based upon the feedback they garner from students. If student responses indicate high levels of mastery, teachers might accelerate their pace. Conversely, if students are answering incorrectly, teachers might adapt by slowing their progression from one concept to the next. In addition to making adaptations within lessons, teachers also adapt subsequent lessons based upon the extent of student understanding. In many high-performing urban schools, we observed teachers using end-of-lesson checks or exit tickets to gauge the extent of student understanding. In some cases, the exit ticket was a set of oral responses to teacher questions. In some cases, the exit ticket required students to demonstrate or model a response. In others, the exit ticket prompted a short written response. The exit ticket helped the teacher know how to adapt the plan for the next day’s instruction to build upon student levels of understanding. If student responses indicated high levels of mastery of the day’s specific objective, the teacher might plan the following lesson to address the next more challenging objective associated with the standard being taught. If exit-ticket responses indicated a lack of understanding, teachers might use the exit ticket to help define specifically what students understood and what they did not understand. Then, the next lesson might be focused in a manner that built upon existing understandings, while addressing the very specific content students still needed to learn. For example, a teacher might use five subtraction word problems as an exit ticket for her math lesson. 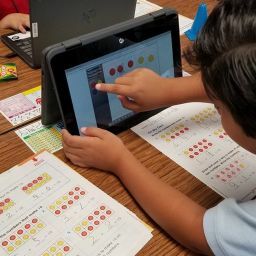 Students might respond to each question by writing each subtraction problem and showing their answers on their personal whiteboards at the teacher’s cue. By watching and noting student responses, the teacher might determine that all but three students answered four of the five questions correctly. Also, the teacher might notice that half of the students answered the problem that required regrouping across zeros incorrectly. In response, the teacher might plan to devote the next lesson to word problems that require regrouping across zeros. Additionally, the teacher might plan a focused intervention session with the three students who needed additional assistance. Example: In Spanish class, the teacher engages students in conjugating the present tense of the verb hablar (to speak). While students successfully repeat the conjugation, several students respond incorrectly when the teacher asks them to explain why they need to know how to conjugate the verb. Then, the teacher strays from her planned activity and writes the word speaks on the board. She asks the students to generate different sentences that correctly employ the verb. Then, she asks students why none of them offered sentences that started with I speaks or We speaks. Students laugh and explain that it would not have been proper English. The teacher then explains how verb conjugations in English follow general rules, just as verb conjugations in Spanish follow general rules. Example: In Spanish class, the teacher engages students in conjugating the present tense of the verb hablar (to speak). While students successfully repeat the conjugation, several students respond incorrectly when the teacher asks them to explain why they need to know how to conjugate the verb. The teacher hears the incorrect answers but does not want to take the time to explain. She continues with the conjugation of the next Spanish verb.